The RTEI 2016 Report is now available online. 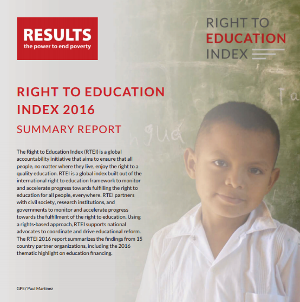 The report describes the state of the right to education in 15 countries: Australia, Canada, Chile, the DRC, Ethiopia, Honduras, Indonesia, Nigeria, Palestine, the Philippines, South Korea, Tanzania, the United Kingdom, the U.S., and Zimbabwe. RTEI 2016 partnered with civil society, research institutions, and governments in these countries to monitor and accelerate progress towards the fulfillment of the right to education. The report summarizes findings from the 2016 Questionnaire and focuses on education financing, especially government expenditure on education, aid, and focused funding on primary, secondary, tertiary, and technical and vocational education. National findings make up RTEI and are included in the full RTEI 2016 report through summaries developed by national partners. 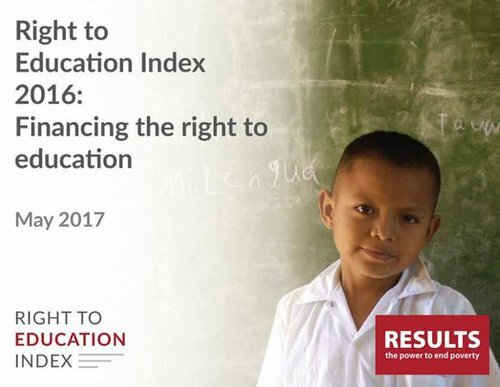 RTEI scores help highlight partner organizations’ findings and support national level advocacy and policies to satisfy the right to education. Civil society organizations in all RTEI 2016 participating countries can use RTEI findings to focus on national level changes, whether in corporal punishment, the treatment of pregnant students, or learning outcomes. All countries in RTEI 2016 have opportunities to further respect, protect, and fulfill the right to education. Increase and target national education financing. Increase budget information transparency and availability. For more information about RTEI 2016 calculations presented in the RTEI 2016 report, click here. In addition to the RTEI 2016 report, the RTEI 2016 Executive Summary is also now available. The summary succinctly presents international and national findings, and is a convenient starting place for those wanting to learn more about RTEI and specific results. The Right to Education in the U.S. The RTEI 2016 report launch on 20 June 2017 was co-sponsored by the Global Campaign for Education – U.S. (GCE-US), and included in depth conversations about the state of the right to education in the U.S. Rashmi K C, former GCE-US fellow who completed the U.S. RTEI research in 2016, posed questions to the audience and shared interesting findings about the satisfaction of the right to education in the U.S.
Click here to test your knowledge about the satisfaction of right to education in the U.S.